The current exhibition of paintings by Francisco Oller at the Brooklyn Museum, Impressionism and the Caribbean: Francisco Oller and His Transatlantic World, is a provocative and difficult show — a collision of curatorial strategies and recalcitrant artwork that defies the interpretive armature. The push and pull between Oller’s paintings and the curatorial approach exposes some of the existing (though often unseen) fault lines underlying our collective notions of what makes Modernism in visual art distinctive, as well as our understanding of the painters who exist on Modernism’s cusp, really neither here nor there. Francisco Oller is such a painter, in some ways unmoored by his idiosyncratic practice and the work he produced, being neither a member of the Romantic movement nor of the French Impressionists, nor being of such singular talent that he could compel his own category in art historical accounts. The curators at the Brooklyn Museum have sought to fashion an identity for Oller, and thus a place in history, making him an ethnic and regional artist, drawing on the raw material of his native Puerto Rico in all its political and social complexity — which they studiously emphasize — and transitioning as a painter toward the newly emergent stylistic movements that were, at the turn of the 20th century, beginning to define European Modernism. To further contextualize Oller as representative of larger movements, Aste and Sullivan use his excursions to Europe as exemplary of a cross-cultural exchange in which European painters sojourned to Puerto Rico and talented apprentices like Oller traveled to Spain and France. On Oller’s second journey to Europe, he studied in Spain at the Royal Academy of Fine Arts with Frederico de Madrazo. His tutelage was successful to a degree because he was named painter to King Amadeo I from 1877 through 1884. He later visited Paris a few times, the last in 1895 to take his painting “The Wake” to the Paris Salon. Aste and Sullivan use the spatial separation between the two galleries that contain the exhibition to distinguish the two epochs they have constructed to explain Oller. 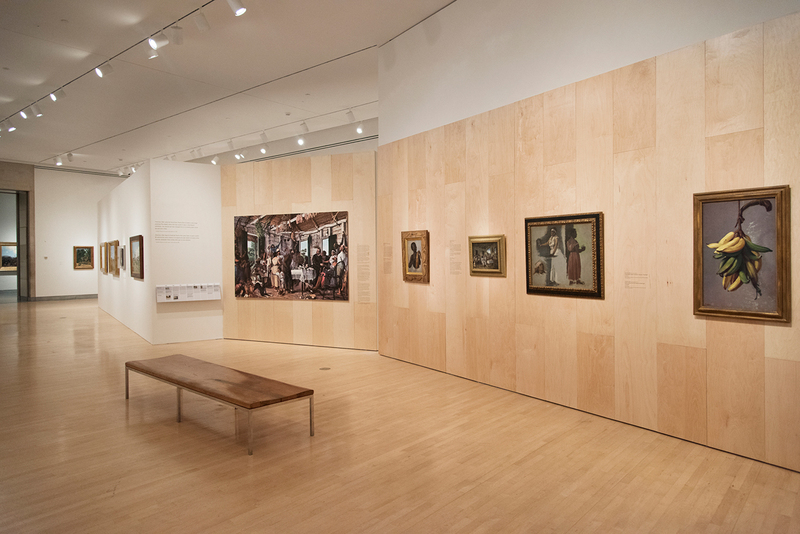 The main gallery initially contextualizes him among a wide variety of portrait, landscape, and still-life painters who either dealt with life in Puerto Rico, using the same subject matter, or had similarities in style. These painters vary from Afro-Cuban and Cuban to Spanish, Venezuelan, and even North American. To underline the point that Oller had introjected the lessons of Impressionism, they use the second smaller gallery to nestle him among paintings by the progenitors of this movement; Courbet, Cezanne, Pissarro, Caillebotte, and Sisley. With this treatment, the curators look to have Oller perceived as a hybridized son of a politically, ethnically, regionally, and stylistically hybrid set of developments. He becomes a key regional transitional figure in the passage to Modernism. The difficulty with this construction is that his work is largely not compelling and therefore struggles to support this view. His landscapes, we are told, show impressionistic touches, but mostly they read as not fully resolved and rather lifeless. 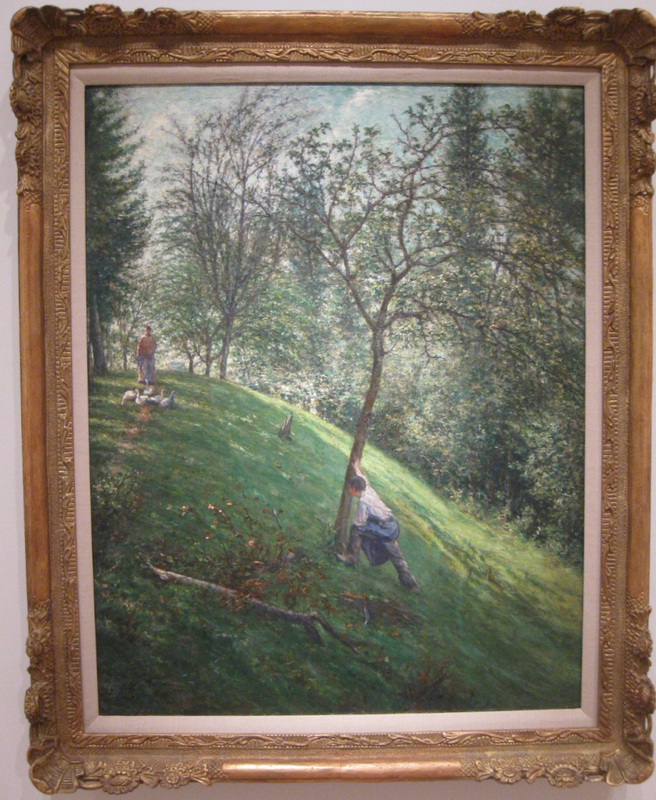 Take, for example, his “French Landscape” (1895–96). In it, the sunlight is diffuse and dappled and handled well, but this does nothing to make the painting read as a particularly charged moment or interlude that is different from what preceded it or what will come after. Oller’s portraits, such as “Colonel Francisco Enrique Contreras” (1880), are fairly stiff and tense, and give little indication of the personality beyond the mocked-up pose, or of the painter’s feelings toward his subject. 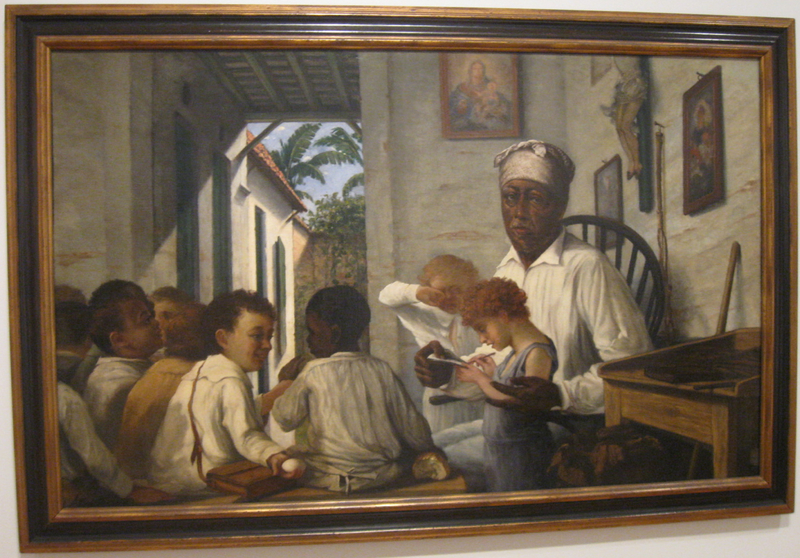 The portrait “Maestro Cordero’s School” (1890) is somewhat of an exception, subtly and profoundly humanizing the central character, while the children around him still remain rather wooden, austere figures. Though “The Wake” (1893) is said to be Oller’s masterpiece, it lacks the pathos powerfully conveyed in Rafael Cordero’s weary gaze. Oller is actually best at his still lifes, such as “Still Life with Plantains and Bananas” (1893), in which the fruit seems to be replete with the force of life and yet slightly mysterious, as though the true reason for its fecundity cannot be known by the viewer. The show raises many questions it does not answer: Why use Oller as a transitional figure? Does his historical position or status as a representative of Puerto Rico trump a concern over the quality of his paintings? At what temporal and geographical points is it fair to say that Modernism begins? It is with the Modernists that monograph exhibitions begin to emphasize the artist’s ideas as manifested in practice and de-emphasize his or her origins? Indeed, Oller constitutes a pivotal transitional figure in the respect that through his treatment within this exhibition we begin to appreciate the distinction between regarding an artist by his particular inflection of cultural inheritance and training, and regarding him as representative of the merits of his own singular practice. Impressionism and the Caribbean: Francisco Oller and His Transatlantic World continues at the Brooklyn Museum (200 Eastern Parkway, Prospect Heights, Brooklyn) through January 3, 2016.